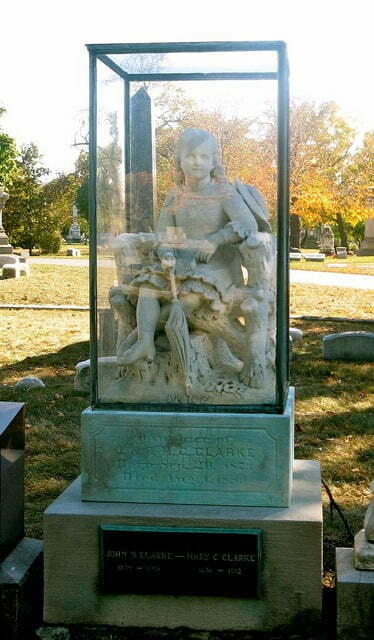 At Graceland Cemetery in Chicago, Illinois, a statue stands out among the tombstones, protected behind glass. But this statue, as ordinary as it may appear, is unlike the others. Some say it’s afraid of thunderstorms. Legend has it that a six-year-old girl, Inez Clarke, was struck by lightning in the late 1800s. A terrible thunderstorm had broken out while she was on a picnic with her parents, and she died before their eyes. They were devastated, so they had a life-sized statue made in her likeness to remember her — a girl sitting on a wooden chair, a subtle smile on her face, holding an umbrella in her right hand. A fitting monument to a life ended too soon. But even in the afterlife, so it would seem, young Inez Clarke remembers, too. They say, when the night is dark and a storm is raging, the statue’s glass case will be found empty. Her spirit is still afraid of thunderstorms. As Graveyards of Chicago recounts, there’s an urban legend about the cemetery involving an old night watchman. He’d been out walking during a thunderstorm and, when he reached the grave of Inez Clarke, he found its glass box empty. The statue inside was gone. According to the legend, the night watchman never again returned to the cemetery, but by the next morning the statue had mysteriously reappeared behind its glass. To this day, the statue is visited, and people often leave gifts for Inez. There are still stories, too, that if you listen quietly, sometimes you’ll hear the sound of a young girl crying near the statue. Some have even claimed to have seen a young girl in old-fashioned dress dancing throughout the graveyard. Of course, as with most folklore, there are questions. In this case, some wonder if an Inez Clarke ever existed. The statue’s location is actually where someone named Amos Briggs is buried, leaving the statue itself mysteriously out of place. Or is it? On the Find A Grave index, there’s a reasonable explanation for this: that the girl’s name was actually Inez Briggs, not Clarke, and is in fact the person buried beneath the statue (it’s worth a look — as I’ve found out myself over the past few weeks while researching genealogy, name misspellings on official documents happen all the time, even errors on old tombstones). Others claim the statue was placed there by a local sculptor as some kind of advertisement, but at that point your guess is as good as mine. To be honest, maybe we shouldn’t get too bogged down in the details. It’s a bit pointless to “debunk” folklore, because stories change (in one version of Inez’s story, she died of tuberculosis) and over-analyzing them misses the point. I say enjoy the story for what it is, and believe it if you feel it rings true. There’s no harm believing in ghosts, anyway.